Roasted vegetables… my recent addiction. Recently I’ve been enjoying the simple taste of roasted vegetables seasoned with only a few ingredients. It’s very easy to make: wash, chop, coat with olive oil, and watch your oven do the rest of the work! They make for a satisfying, healthy, light lunch or side. The three roasted vegetable dishes that I’ve found myself making over and over the past few weeks are roasted cauliflower topped with a home-made tahini sauce (recipe to come), roasted onions/bell peppers/ broccoli/asparagus topped with a Fig Balsamic Vinegar from Baker & Olive, and this Italian recipe which I’m sharing with all of you today. 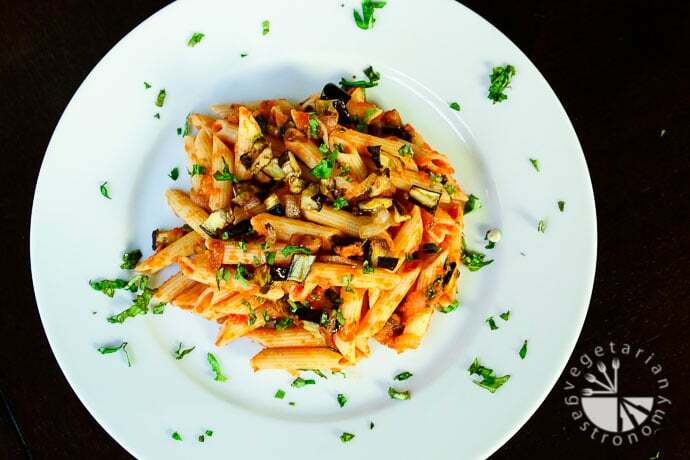 Penne w/ Roasted Eggplant and Caramelized Onions tossed with a Tomato-Garlic-Basil Sauce. This recipe was created through trial and error. 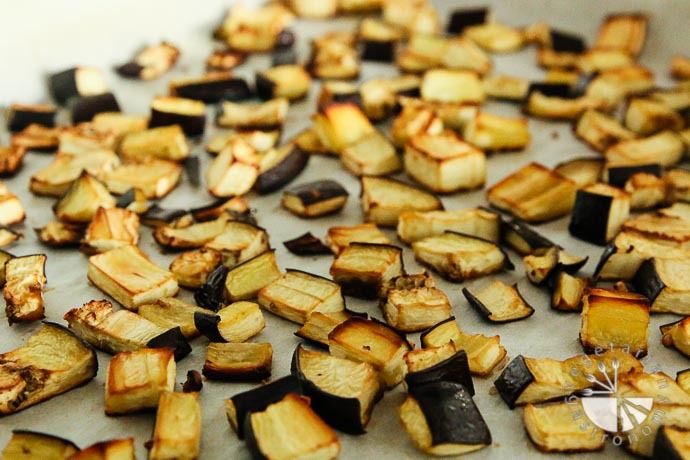 In efforts to use up some home-grown eggplant, I tried roasting them and adding them to several dishes, but realized that although the roasted eggplant tasted great on their own, they didn’t quite go well with my balsamic vinegars or traditional simple seasonings. So, I decided to toss them into a pasta dish. 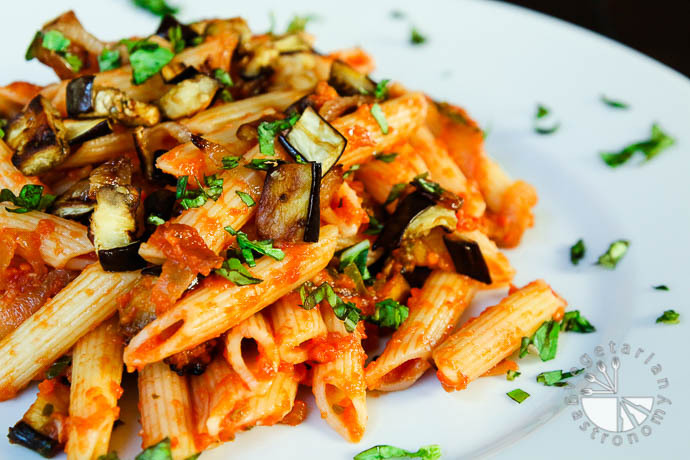 I recalled a restaurant my husband and I would frequent in Little Italy, San Diego, where I loved this pasta with simple grilled vegetables and tomatoes, of which the eggplant was the highlight. The soft texture of the eggplant absorbed the sauce and flavors well. I wasn’t quite sure whether they fried or baked the eggplant in the dish. In any case, I intended on creating a baked version of that pasta. Additionally, I decided to caramelize some onions, because I knew the sweetness would go great with the earthy, roasted flavor of the eggplants. For the sauce, I wanted to keep it simple. I did not have fresh tomatoes on hand to make my spicy tomato sauce (recipe coming soon), but I did have a can of diced tomatoes so decided to quickly throw together a garlic-tomato-basil pasta sauce. The beauty of this recipe is that you can easily multi-task, having the different components of the dish cooking all at once. First, I prep and chop all the ingredients. Then, once the eggplant is roasting in the oven, you can easily set one pot to make your sauce, and another pan to caramelize your onions. Everything should be done cooking at more-or-less the same time. Finally, cook your pasta and toss everything together for a delicious vegan pasta dish. My entire family loved it, and I found another great dish using roasted vegetables. The sweetness of the onions, combined with oven roasted eggplant, and tangy homemade tomato sauce makes for the ultimate comfort Italian dish! 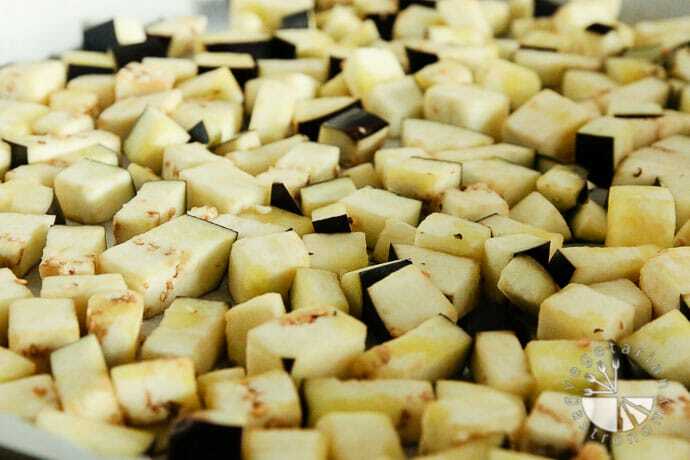 Toss the diced eggplant with some olive oil (enough to coat the eggplant). 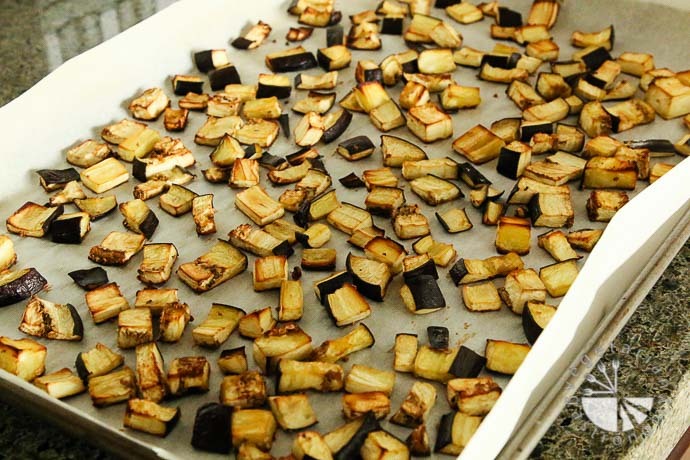 Line a baking sheet with parchment paper and place the eggplant in a single layer on the parchment paper. Bake for about 25 minutes until cooked and fully roasted (slightly browned, but not burned). Heat 2-3 tbsp olive oil on a non-stick large pan on low-medium heat. 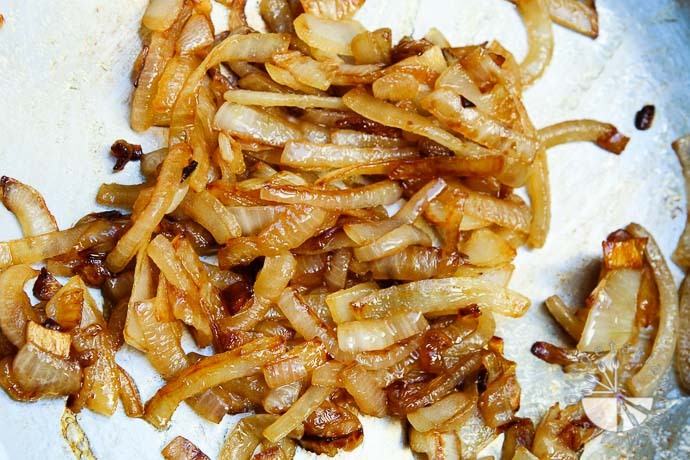 Add the thinly sliced white onions and an pinch of salt, and saute until they become completely translucent, slightly brown, and just caramelized (~25 minutes). Be sure to mix frequently. If you find that the onions start sticking to the bottom of the pan or start to burn, feel free to add a little more olive oil. Once the onions are caramelized, de-glaze the pan by adding a slash of cooking wine to the pan. Heat 3 tbsp of oil in a medium sized pot on medium heat. Add 8 cloves minced garlic and some dried red crushed peppers (more or less to taste depending on spice preference). Fry for ~30 sec. until fragrant. Be careful not to burn them. Add the can of diced tomatoes. Once the sauce is simmering, reduce the heat to low-medium and simmer uncovered for about 15-20 minutes or until the sauce thickens and reduces to about 2 cups. Add the chopped basil. Season to taste with salt, pepper, and white sugar (if needed). Cook for another 5 minutes. Turn off the heat and set aside (note: if you are almost done with the recipe, feel free to keep heating the sauce at lowest setting possible to keep the sauce hot until the pasta is ready). Set a large pot of water to boil. Add a generous pinch of salt and a drizzle of olive oil. Once the water is boiling, add the penne pasta and cook al dente. 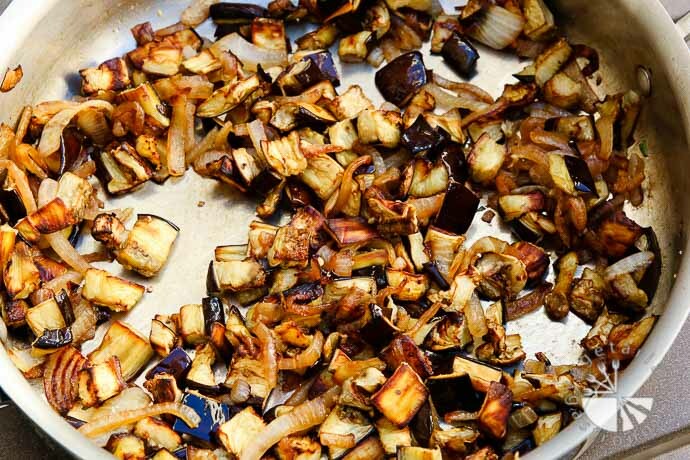 Add the roasted eggplant to the de-glazed pan with caramelized onions. Add the hot tomato sauce and cooked penne pasta. Toss everything to combine. Season with salt and pepper to taste. Garnish with some freshly chopped basil. Top with some fresh Parmesan cheese (omit for vegan option), and serve hot! Gluten-Free Pasta - There are many gluten-free pasta options you can choose from. My favorite for this dish is brown rice pasta. 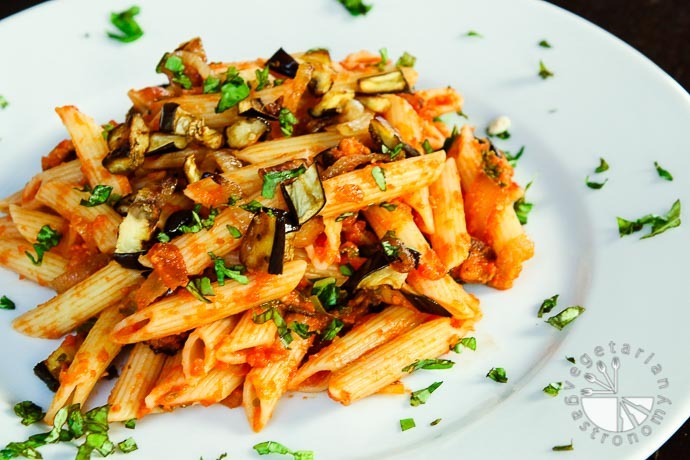 Wow, very nice recipe of pasta with eggplant, I have never tried them together. Thank you! 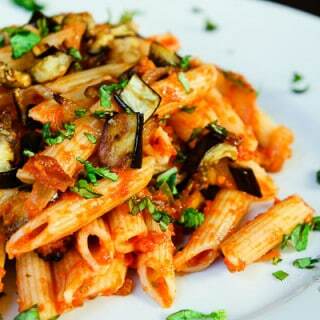 Eggplant tastes great in pasta recipes, if cooked right! And roasting them is my favorite cooking method for adding into pastas. 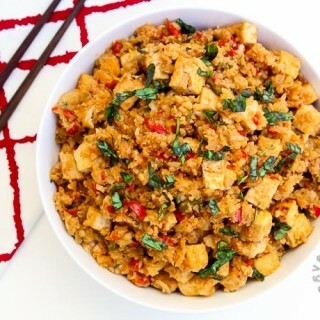 Hope you get a chance to try out the recipe! Hi, can i roast the eggplant & store in the fridge, then finish making the dish the next day? I get home from work so late that i have to get to bed sion after getting home. Thanks! Yes absolutely! I've caramelized the onions and roasted the eggplant ahead of time and then simply mixed them into the sauce the following day! Let me know how you like it! 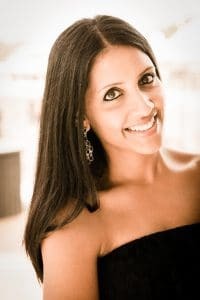 Great recipe, Anjali! My husband and I tried this one out last night. The roasted eggplant texture made this pasta very satisfying to me. We had some extra mushrooms in the fridge. My husband isn't a fan of mushrooms, so I sauteed them on the side and just added them to my serving. I thought it went well too. My husband also really enjoyed it with out. Thanks for sharing! Thank you!! So glad you guys enjoyed this recipe! 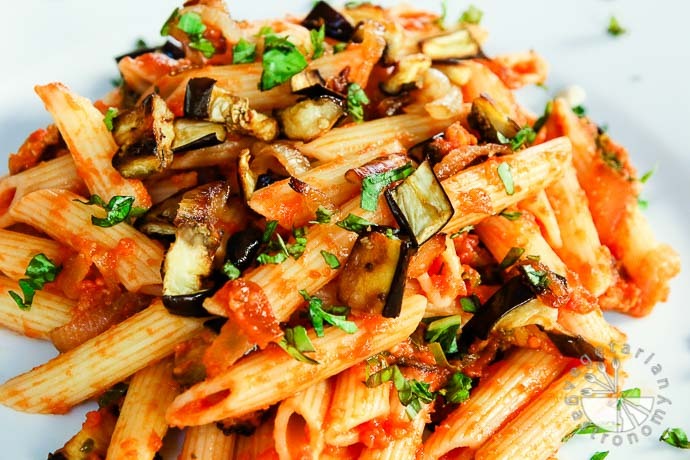 It's seriously one of my favorite combinations, and I love how much better eggplant tastes in pasta when roasted. I love mushrooms and tend to add them to everything as well. Thanks for the comment and for trying out the recipe! You will love it! It's one of my favorite pasta dishes and really full of flavor. Let me know what you think one you try it out! onions, eggplant, and tomatoes...i'm IN! My boyfriend and I made this last week. We are not vegesauruses so we added some sicilian sausage. This was the most amazing recipe!!! Thank you. Thank you! So glad you loved it! The sauce comes together perfectly! That's so great to hear!! Mushrooms and broccoli sound like the perfect addition. Thanks for the great review!